At the beginning of october, International Breast Cancer Awareness Month, the company Avon has donated about EUR 43,000 in Montenegro and Macedonia. As part of the campaign “Show that you care” (“Pokaži da ti je stalo”) in Montenegro, Avon released a line of products marked with a pink ribbon. Avon has dedicated the gross profit from these products to the fight against breast cancer. This is how almost EUR 30,000 has been raised for the purchase of an ultrasound device, which Avon donated to the Montenegro Clinical Center (Klinički centar Crne Gore). Branimir Vlahović, director of the Center for diagnostic radiology pointed out that the device will greatly enhance the quality and precision of ultrasound diagnosis, and Filip Popović, director of Avon Cosmetics Montenegro reminded that apart from good quality medical equipment and competent staff, a crucial component of breast cancer treatment are also regular checkups. Avon is also organizing a race under the slogan “In her shoes” (“U njenim cipelama”) on 13th October in Podgorica. The event will be an opportunity for men to symbolically support for the women in their lives and show they care for their health. “It is important to talk about this topic, and not treat it as a taboo - to educate more ladies of all generations, but also their partners, men, brothers, fathers, as they also play a key role in the health of women. I invite you to show that you care by reminding your mothers, wives, sisters and daughters to get their medical checkups. Encourage your women colleagues, neighbours and friends to do the same. It’s the fight of all of us and together we can make a difference we wish to see - and that is to make a positive impact on a problem which women all over the world are facing”, said Miroslava Pavlović-Marjanović, Avon director for the Adriatic region during the presentation of the donation. In Macedonia, Avon has been the strategic partner of the association for fighting breast cancer Borka for 10 years. On 7th October the traditional walk “Go Pink” (Напред розово”) took place in Skopje. 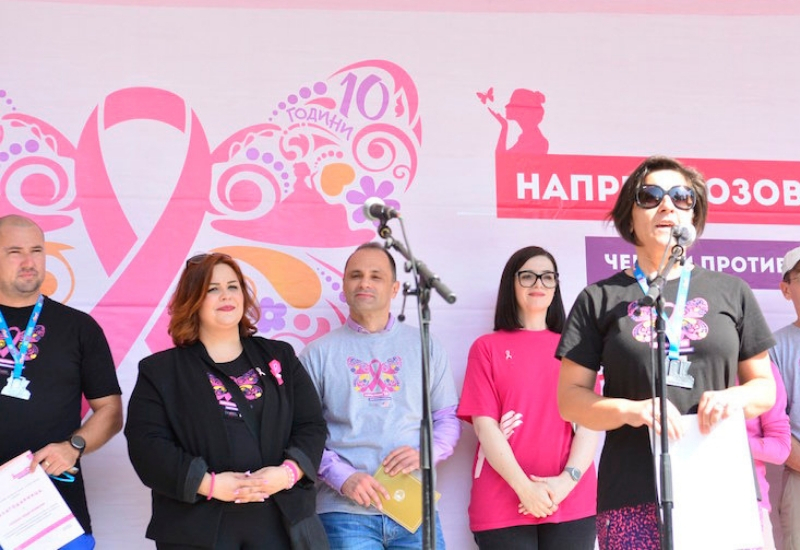 The event has marked 10 years of the national breast cancer awareness campaign in Macedonia. On this occasion, Avon announced that it would donate about EUR 13,000 (USD 15,000) to Borka, in support of its activities. The money will be used to establish a mobile SOS line for people with breast cancer and their families, as well as different initiatives aimed at educating the citizens of Macedonia about the risks, ways of prevention and the importance of early detection, especially among the younger population. The event in Skopje, co-organized by Borka and Avon, with the support of the American embassy, gathered many people wanting to raise awareness of breast cancer, the significance of prevention as well as those wanting to show solidarity with people living with breast cancer.